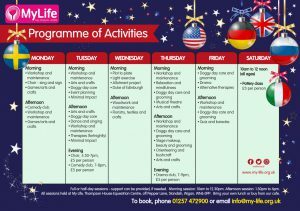 There’s lots going on at My Life for people of all ages and abilities. We organise trips and social activities for our members, including theme park visits, fun days, BBQs, pantomimes, live shows and much more. If you have a disability and need support, you will need to bring your PA or carer, as we don’t provide direct support and personal care on our trips. Wherever possible, we try to make sure that the person who is supporting you doesn’t have to pay, or pays a reduced rate. Our Opportunities Programme lists our timetable of classes & activities. 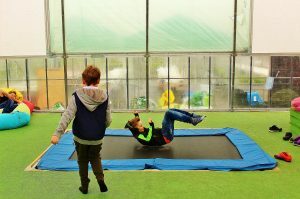 Our School Holiday Activities are just £20 per child per day. They are a great way to get kids out in the fresh air and meet new friends. We also run an inclusive Club Night for adults aged 18+ which is held every first Tuesday of the month. Our FREE Pathways to Employment (P2E) course links people who would love to work in health and social care with families looking for a support worker. All of our events are visible on the Events Calendar. We welcome suggestions from our members for new events, trips and experiences. Our philosophy at My Life is to encourage and inspire individuals of any age and ability through an innovative approach to learning and discovery, in a beautiful country location with indoor and outdoor opportunities all year round. Children, young people and adults are offered regular workshops to achieve and develop confidence through hands on learning, either in a group setting or on an individual basis. The programme is based on a wide range of opportunities, including the natural environment, the recognition of plants, caring for animals and helping to preserve our planet. Personal skills are considered highly valuable, such as team work, problem solving and self development. Our mission is to not hurry people into taking exams and certificates, but to take our time so individuals can be mindful and genuinely learn and discover at their own pace. Although the programme offers something for everyone, we can arrange for additional sessions or one to one sessions in carriage driving, equine studies, horticulture, postural care and other aspects of learning, both indoors and outdoors. We are learning what appeals to individuals and groups of people and have the flexibility to adapt our programme as we evolve, develop, but more importantly get to know individuals who would like to spend some time with us. Our school holiday activities are for children of all ages and abilities (under 8s must be accompanied by an adult). They run from 10am to 3pm, Monday to Friday (excluding Bank Holidays), and the cost is just £20 per child per day. It’s a great way to get kids out in the fresh air and meet new friends. For the perfect gift, why not adopt one of our animals! For just £100 per year, you get an adoption certificate, regular letters keeping you up-to-date about your chosen animal, and My Life membership is included. There really is lots going on, come down and visit us, phone 01257 472900 or email info@my-life.org.uk to find out more. *Please note: if your child needs 1:1 or 2:1 support, this will be charged separately. Our inclusive clubnights are held on the first Tuesday of every month. It’s open to members and non-members, but you must be aged 18 or over. Tickets cost £2 for members and PAs/support workers, and must be bought in advance. We do not sell tickets on the door. For tickets, phone: 01257 472900. You can pay over the phone and we can post them out to you. If you pay this way there is an additional £1.50 admin and postage charge. You can send us a stamped addressed envelope and pay by cheque. Remember to state on the back how many tickets you need and for which month(s). Please make your cheque payable to ‘My Life Legacy’. You can call and pick them up at either our Standish or Leigh sites. It’s usually best to ring us before you arrive, so that we have the tickets ready for you. Phone 01257 472900 (Standish), or 01942 487854 (Leigh). Visit facebook.com/RespectReflex for more details. 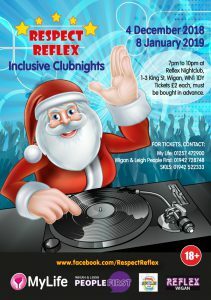 Venue: Reflex Nightclub, King Street, Wigan. Our Pathways to Employment course is unique. It matches people who are passionate about supporting others to get the best life possible, to individuals who are looking for great staff. The course is FREE and includes a one-hour introduction, then three full-days of training, usually set over a three week period. At the introduction session we talk about our values and our ethos and explain more about the course. Then we tell you how you can apply for the free training. The training is like no other – it’s not the usual classroom-based stuff. It’s very interactive and fun, and it’s a way for us to test out your skills in working as a team and how you interact with others. The course has a huge success rate as over 85% of those who have been on it have gone on to get employment with us, or have been matched with families either in their own homes or working out in the community. Due to continued demand, My Life is re-running this FREE workshop for individuals, families, carers and advocates to help you understand the questions on your personal independence payment (PIP) application form more clearly and enable you to fill it in. 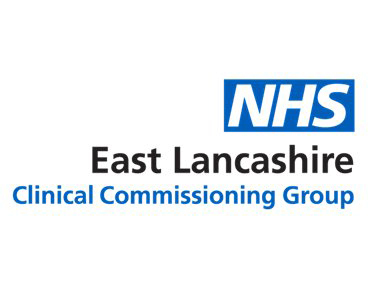 The workshop is taking place on Friday, 30 November 2018 from 10am until 12.30pm at our Standish based. Refreshments are provided and lunch is available to buy from our cafe. You may get the mobility component of PIP if you need help going out or moving around. 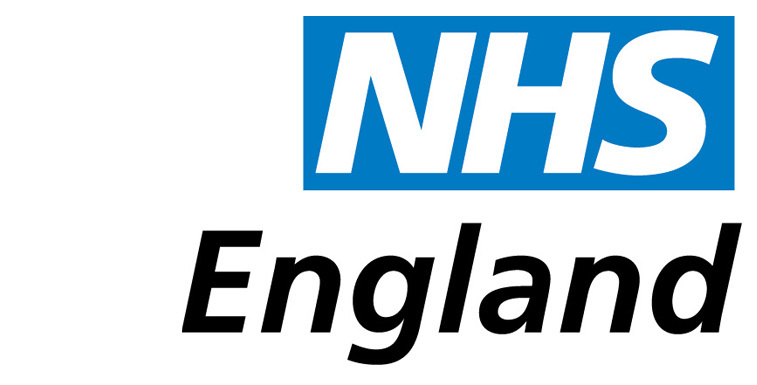 If you are unsure if you are eligible, still come along and we will work through this. Please bring the form with you and we will work through it together during the workshop. maybe not for you, but for the 406,000 people living in care homes. 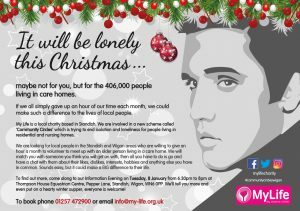 If we all simply gave up an hour of our time each month, we could make such a difference to the lives of local people. My Life is involved in a new scheme called ‘Community Circles’ which is trying to end isolation and loneliness for people living in residential and nursing homes. We are looking for local people in the Standish and Wigan areas who are willing to give an hour a month to volunteer to meet up with an older person living in a care home. We will match you with someone you think you will get on with, then all you have to do is go and have a chat with them about their likes, dislikes, interests, hobbies and anything else you have in common. Sounds easy, but it could make a BIG difference to their life. To find out more, come along to our Information Evening on Tuesday, 8 January from 6.30pm to 8pm at our Standish site. We’ll tell you more and even put on a hearty winter supper, everyone is welcome!